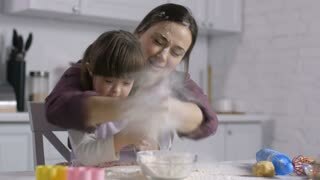 Positive mother and joyful little daughter with special needs having fun and playing with flour while cooking together. Happy cooking family stained with flour from head to toe baking in the kitchen. 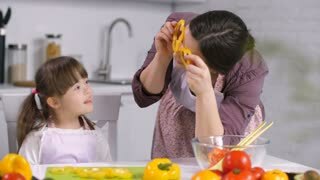 Joyful carefree mother and cute special needs daughter in matching aprons preparing dough for baking, having fun, arms and faces stained with flour. Cooking family stained with flour making batter. Carefree cute young mother and daughter fooling in the kitchen. Mom and child have fun together. 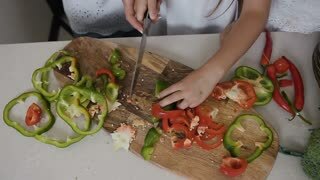 Joyful sisters fooling around coocking a vegetable salad applying cucumber slices to their eyes sitting in the kitchen. Sisters relationship.